Dry granulation by roller compaction is a routinely applied continuous process to convert fine, difficult to handle powders into uniform granular products that flow freely and perform efficiently in subsequent manufacturing steps. The advantages of roller compaction include relatively modest capital investment, low running and maintenance costs, and high energy efficiency. 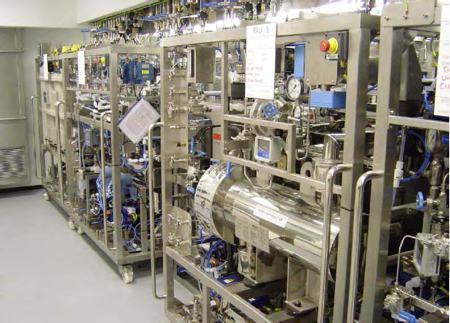 Particularly suitable for moisture- or heat-sensitive materials and those that require ultra-high containment, dry granulation is an important step in the production of many pharmaceuticals, foods and chemicals, including detergents, plastics and toners. Gerteis Maschinen + Processengineering (Jona, Switzerland) is a market leader in the design and supply of premium roller compaction equipment. 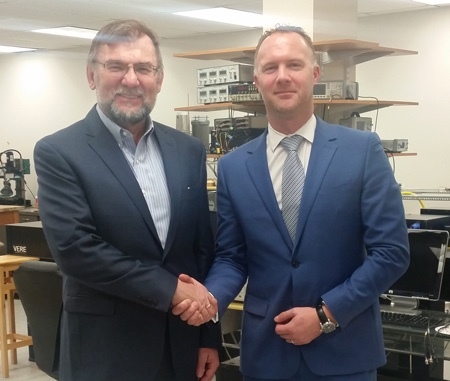 In this article, we present results from a collaborative study between Gerteis and Freeman Technology (Tewkesbury, UK), a company with a global reputation for its expertise in powder characterisation, to identify powder properties that characterise dry granulates in a commercially relevant way and support the optimisation of roller compaction processes. The study assessed the potential of dynamic, shear and bulk powder properties within this context. Figure 1 provides a cutaway view of a typical roller compactor design from Gerteis. 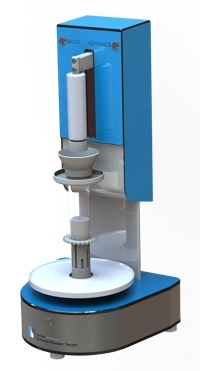 The dry powder feed enters through the inlet funnel on the top of the unit, which typically incorporates an agitator to promote consistent powder flow. A feed auger and tamp auger control the flow of powder into the compaction zone of the machine between the two press rollers. An additional smaller hopper can be used for additives or when compacting very small quantities of material. As the powder flows between the two rollers, it is subjected to a closely controlled compacting force to produce a continuous ribbon of consolidated powder. containment, most especially of fines. 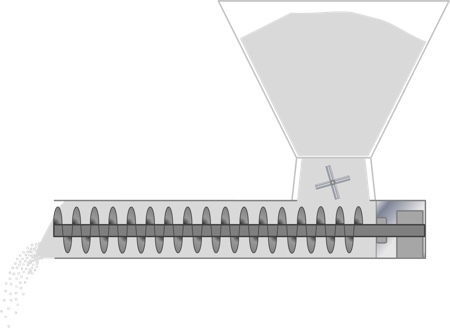 Once a machine has been selected, the primary processing parameter to control the properties of the resulting granules is the applied compaction force. This force is expressed as a stress in kN/cm — the force per cm roll width — which defines the compressive stress that the powder is subjected to as it passes through the rollers. The other important process parameter is gap width — the distance between the rollers. At any given force, the thickness of the resulting ribbon and the rate at which powder is conveyed to the rollers are directly correlated. In some machines, gap width is maintained at a fixed value, in which case variability in the feed material directly impacts the amount of powder drawn into the compaction area and the properties of the ribbon. This approach can lead to large fluctuations in both ribbon and granulate properties. For this reason, all Gerteis machines have a floating gap design. This means that the distance between the rollers varies around a set point to maintain a consistent applied compaction force and minimise property fluctuations in the granules. In summary, the properties of the granules produced by roller compaction are primarily controlled by manipulating the force and gap width applied in their manufacture. This raises the question of how best to characterise granules to support effective control of the roller compaction process to produce material that is optimised for subsequent manufacturing steps. An experimental study was done to investigate correlations between the dynamic, shear and bulk powder properties of granules to assess which of these might be most useful in providing relevant data. In phase I of the trial, six batches of granules were produced at different compaction forces (3–12kN/cm) to directly investigate the effect of compaction force on granule properties. The formulation used was a typical pharmaceutical placebo with consistent, well-controlled properties. Roller speed, sieve size and roller gap were all kept constant. Table I provides full details of the experimental conditions applied. 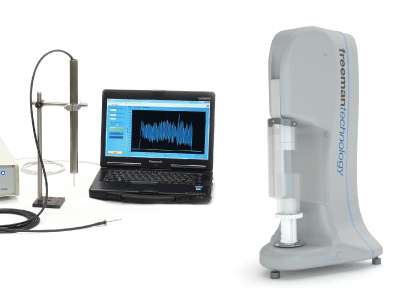 Batches I, III and V were assessed using the full test capabilities of the FT4 Powder Rheometer. However, these initial results suggested that shear properties, including wall friction data, showed little correlation with changes in compaction force, suggesting that they have limited relevance. 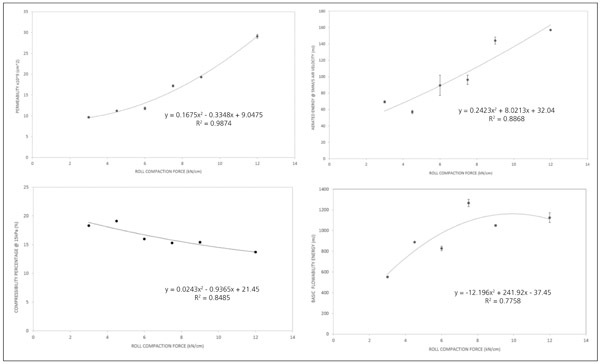 As a result, only dynamic and bulk properties were measured for batches II, IV and VI. Figure 2 shows a selection of the strongest correlations revealed by this work. Each experiment was conducted in duplicate and the RSD% of the resulting data was typically less than 5%, as shown by the error bars. 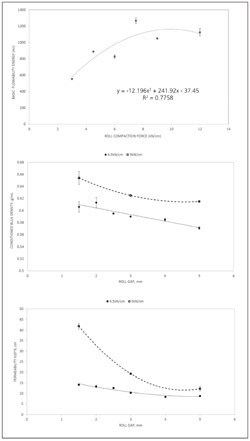 These results show that, as the roller compaction force is increased, the compressibility of the resulting granules decreases, while their permeability and conditioned bulk density (CBD) increases (data not shown). This suggests that higher compaction forces lead to denser granules that exhibit more efficient particle packing, giving a higher bulk density. More efficient packing also reduces the ease with which the volume of a powder sample can be further reduced; that is, it leads to lower compressibility, a change that would directly influence performance in a tableting press. The trend for permeability suggests that higher compaction may additionally influence the level of fines incorporated in the granules. Fines in a sample typically reduce permeability by filling the interstices between larger particles, so the observed increase is suggestive of a reduction in fines at higher compaction forces. This effect would not be counteracted by a post-compaction milling step, which simply reduces the size of overly large granules to an acceptable Dv90, rather than controlling particle size distribution. In terms of dynamic properties, the aerated energy (AE) of the granules increases steadily with compaction force. 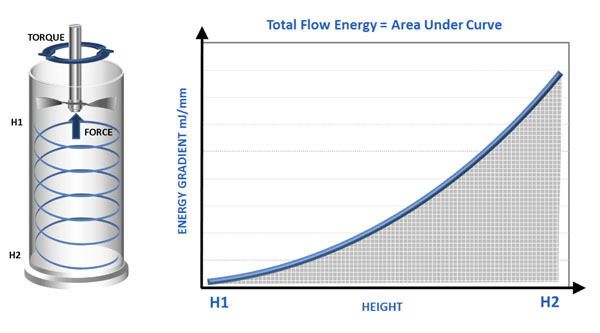 AE is the energy associated with inducing flow when a powder is in an aerated or low stress state. As AE is measured under consistent conditions, particularly regarding the upward air flow applied, the observed increase is consistent with steadily increasing particle density. Denser, less buoyant particles are more difficult to aerate and so the air applied during testing has less effect on flow energy than with lighter particles. The Basic Flowability Energy (BFE) of the granules increases with compaction force in a similar way to AE, although the relationship exhibits greater non-linearity. BFE is the energy associated with forcing the powder to flow by applying a compacting blade action; it is sensitive to multiple particle properties, including particle stiffness and size, as well as density. Denser particles are more difficult to move under these forcing conditions, so the rise in BFE with compaction force is consistent with the other data. However, the non-linearity of the observed relationship suggests that changes in particle size distribution or stiffness may begin to offset this effect at higher compaction pressures. Phase II of the study was designed to investigate correlations between granule properties and roller gap width. In a first set of experiments, compaction force was maintained at 4.5kN/cm, while gap width was increased from 1.5–5mm in six discrete experiments (see Table II). Roller speed was kept constant. Batches II, IV and VI were subject to dynamic, bulk and shear characterisation, but shear analysis was omitted for Batches I, III and V because of its failure to differentiate the samples (as in the preceding part of the study). To extend the investigation of the effect of gap width, a second set of experimental data was also analysed (some drawn from preceding tests) to produce comparative data at a compaction force of 9kN/cm. At both compaction forces, gap width was observed to have a direct influence on the bulk properties of the granules produced — compressibility, permeability and CBD (Figure 3). The trends observed are all consistent with narrower gap widths producing denser granules that pack more effectively. The permeability trend observed at 9kN/cm is substantially more marked than at 4.5kN/cm and suggests, at low gap widths, the relatively high compaction force ensures highly efficient compaction across the ribbon depth, effectively incorporating the majority of fines into a dense granule. 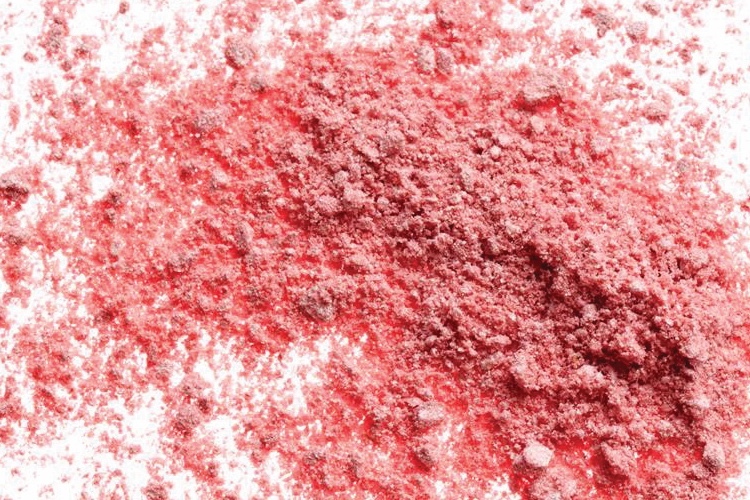 The fact that these data reveal no robust correlations for any of the other powder properties measured can be attributed somewhat to greater variability in the data produced in this part of the study. Generally speaking, larger gap widths tend to be associated with less consistent granule properties. This may be because it becomes more difficult to subject the powder to a consistent consolidation regime as gap width widens. This is an important observation in itself, but one that complicates the development of robust relationships between gap width and granule properties. In experimental studies, direct correlations were observed between the dynamic and bulk properties of granules and the roller compaction force and gap width applied in their manufacture. Increasing compaction force produces denser, more free-flowing granules with lower compressibility and higher permeability. Reducing gap width has a similar, but less pronounced effect. 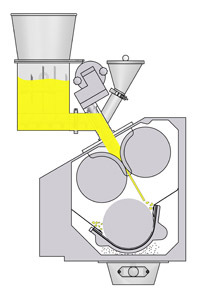 Previous studies have indicated that there is a direct correlation between the dynamic and bulk properties of granules and quality attributes of tablets produced from them — hardness and stability, for example.2 The results presented here therefore suggest that multifaceted powder characterisation can provide the data required to optimise roller compaction/dry granulation processes to ensure high performance in either an intermediate or finished product. 1. R. Freeman, ‘Measuring the Flow Properties of Consolidated, Conditioned and Aerated Powders: A Comparative Study Using a Powder Rheometer and a Rotational Shear Cell,’ Powder Technology 174(1–2), 25–33 (2007). 2. T. Freeman, ‘In Pursuit of Wet Granulation Optimisation,’ Pharmaceutical Manufacturing (March 2014): www.pharmamanufacturing.com/articles/2014/in-pursuit-of-wet-granulation-optimization.